Thessaloniki, a crossroads between the East and West that was ruled by the Romans and Ottomans, invaded by pirates and was a port city occupying an important position in the Byzantine Empire, is a multicultural hodgepodge. Its location on the Aegean Sea has ensured the northern Greek city’s standing as one of the Balkans’ most important commercial centres and ports for the past 2,300 years. Muslims, Jewish refugees expelled from Spain and Greeks driven out of Asia Minor, Eastern Thrace and the Black Sea coast have enjoyed a harmonious co-existence over the centuries, and their presence is evident throughout Thessaloniki: in its architecture, monuments, religious centres, art and in its gastronomy. Today, a 150,000-strong student population spread between three universities and four colleges keeps Greece’s second-largest city feeling youthful and bursting with life. The country’s financial difficulties are evident in some areas, while investors are starting to pump money into redevelopment. In recent years, Thessaloniki has unwittingly transformed itself into a cultural and culinary hotspot, making it an attractive city break destination for history buffs, food lovers and adventurous youngsters. With its dark and broody atmosphere and captivating contemporary art installations, The Met (www.themethotel.gr) stands out as the most interesting luxury five-star hotel in Thessaloniki. Designed by Greek architect Tasos Zeppos with neo-1960s flair, its rooftop Sky Bar offers panoramic views of the city and the port. Doubles start from €120 (Dh541). The Excelsior (www.excelsiorhotel.gr), a family-owned boutique hotel erected in 1924 is centrally located and delivers the warm hospitality for which the people of Thessaloniki are renowned. An eclectic breakfast menu is available, while seats for a long Sunday brunch at street level restaurant Be* are sought after. Room rates start at €120 (Dh541). Colors Hotel (www.colorshotel.gr), near Aristotelous Square, is one of several new boutique hotels that have opened in the city centre. Rooms cost from €60 (Dh267). Thessaloniki is mostly a walkable city. Start at Aristotelous Square, where the neoclassical Olympion Theatre and Electra Palace hotel stand tall. Take a stroll along seafront Nikis Avenue to the White Tower, which has served many purposes, including a prison. A must-see is Agios Dimitrios church, which features a crypt with early Christian and Byzantine artifacts. Dedicated to the city’s patron saint, it forms part of Thessaloniki’s presence in Unesco’s World Heritage List. The Arch of Galerius, built in 305 to commemorate Roman emperor Galerius’ defeat of the Persians, is decorated with reliefs representing battle scenes. Nearby is the early fourth century Rotunda, also built during the emperor’s reign, where traces of mosaics depicting angels, martyrs and saints survive intact. The Roman Forum, one of the city’s most important ancient sites, served as Thessaloniki’s economic, social, political and religious centre. Ottoman highlights include the former Turkish baths Bey Hamam, the Bezesteni markets that have retained their traditional character, and the Alatza Imaret mosque, which today hosts cultural events. Contemporary cultural attractions in the city include the Museum of Photography, the Teloglion Fine Arts Foundation and the State Museum of Contemporary Art. When the Sun is out, so is all of Thessaloniki. Cafes are abuzz all day and night in this caffeine-centric town. Families, couples and students stroll up and down the sprawling New Waterfront, designed by the Nikiforidis-Cuomo architectural team, where an imposing statue of Alexander the Great resides. It’s there you can catch sunset over the Thermaic Gulf through the prism of Greek artist George Zongolopoulos’ Umbrellas sculpture and, on a clear day, views of snow-capped Mount Olympus. The pace of life, more laid back than Athens, is epitomised in the local phrase “halara”, which means take it easy. Thessalonians are deeply passionate about their city and their football teams but they’re also a cultured lot. This city worships cinema and, every year, the Thessaloniki International Film Festival and Thessaloniki Documentary Festival attract a devoted fan base from within Greece and from abroad. Energetic outdoor music and street food festivals are multiplying, with outfits like SoulFood Thessaloniki leading the charge. In the evening, the city’s youth gathers at the cafes and restaurants on the cobblestone streets of Ladadika, the former oil and spice merchants’ district, and in and around Valaoritou Street. In this city, which many consider Greece’s culinary queen, food is taken very seriously. Dining out is affordable thanks to limited student budgets; the choice is varied and the quality high. Meze is king and most traditional eateries, known as mezedopolia and tsipouradika, are concentrated in Ladadika. Menus reveal clear culinary influences from Asia Minor and the Black Sea. It’s all about sharing dishes at Full Tou Meze (3 Katouni St, www.fullmeze.gr), a deli-style mezedopolio in Ladadika, order flash-fried small fish, oven-baked giant beans and hearty Constantinople cuisine staples such as veal with smoked eggplant puree. Marea Sea Spirit (13 Lori Margariti, St, mareaseaspirit.gr) delivers exceptional seafood, including sea bass carpaccio with truffle, velvety taramosalata and local blue crab at fair prices. The ladies of Thessaloniki, known for being fashion forward, traditionally wouldn’t dare leave the house with a hair out of place. They have adopted a more casual approach these days, but you’ll still see them clicking their heels on Tsimiski Street, where most of the city’s clothing and shoe stores are found. Mitropoleos Street is a particularly chic part of town with some of the city’s best boutiques, brandishing Greek and global brands. Hello From Thessaloniki (www.facebook.com/hellofromthessaloniki) stocks fun Thessaloniki-inspired memorabilia, which is crafted by more than 70 Greek designers. There’s no reason to hire a car and try to navigate the city’s traffic. While the city’s underground metro system is being painstakingly built and testing the patience of locals, the most efficient and affordable way to move about Thessaloniki is on foot, by bus or taxi. Thessaloniki Urban Adventures (www.thessalonikiurbanadventures.com) will help you unravel the layers of history through a small group or private walking tour with an expert guide. 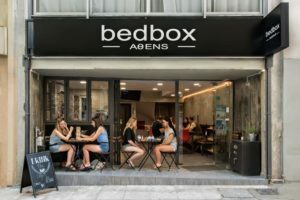 Enthusiastic students lead tours of hip neighbourhoods you might not otherwise find, and food tours featuring the Kapani street markets, Thessaloniki’s beloved bougatsa (a pie filled with custard, cheese or ground beef) and Pontic delights. As of mid-June FlyDubai will fly direct from Dubai to Thessaloniki, from Dh2,035 return.